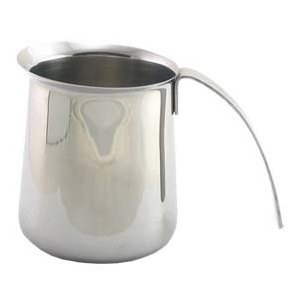 Krups Stainless Steel Frothing Pitcher 12 Oz. Krups XS5012 frothing pitcher, with its stainless-steel polished-to-mirror-finish outside and brushed inside, works great for frothing milk to make cappuccinos and cafe lattes. This pitcher holds up to 12 ounces of milk, and its long easy-grip handle and drip-resistant lip ensures graceful pouring. Remember, the frothing pitcher cleans up quickly by hand or in the dishwasher. The pitcher measures 3.3 by 4.67 by 3.8 inches. 554 583 865 866 867 871 872 880 888 889 890 894 905 962 968 980 985 FND1 FNP1 XP1020 XP1500 XP1530 XP2010 XP2070 XP4000 XP4030 XP4050 XP5000 XP5080 XP5220 XP522050/1PO XP5240 XP524050/1PO XP5280 XP528050/1PO XP7200 XP7200J4 XP7220 XP7220J4 XP7225 XP7225J4 XP7225J4/70F XP7225J4/70G XP7230 XP7230J4 XP7230J4/70F XP7230J4/70G XP7240 XP7245 XP7245J4 XP7250 XP7260 XP7260J4 XP7260J4/70G XP9000.